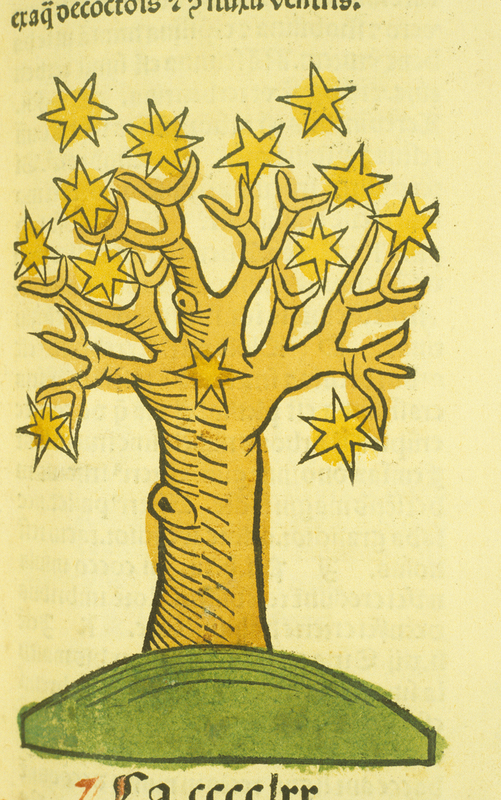 Hand-colored woodcut of a tree from Ortus Sanitatis, bearing leaves in a golden color often seen on trees during autumn. The autumnal equinox has come and gone, and what lies ahead of us are cooler temperatures, falling leaves, and the beginning of the holiday season. The upcoming months also bring us national and international observances, holidays, and events, some familiar, some a bit obscure. In recognition of the season, we hope you enjoy this gallery of specially selected images of autumn from the National Library of Medicine’s (NLM) historical collections. Hand-colored engraving of the flowers and seeds of starwort from Elizabeth Blackwell’s, “A Curious Herbal.” The starwort thrives during the cooler months of autumn. Woodcut from Conrad Gessner’s, “Historiae Animalium, Vol. 3,” illustrating a turkey, the ubiquitous bird seen everywhere on Thanksgiving. Patent medicine card advertising William S. Norris & Bro., Surgeon Dentists of Baltimore, showing an autumnal scene. In the United States, Daylight Saving Time (DST) ends the first Sunday in November. Postcard created by company Estée Lauder in honor of breast cancer awareness month which takes place annually in the United States in October. The postcard comes with a pink ribbon, the symbol of breast cancer awareness. Poster published in Germany that features a witch mixing potions in a cauldron is a public service message aimed at preventing workplace accidents. Poster from the United Nations Association of Great Britain and Northern Ireland commemorating United Nations Day, an annual, international celebration observed on October 24. Illustrated postcard of a nurse feeding a baby in a hospital room at the Methodist Hospital of Dallas that overlooks trees with autumn’s colorful leaves. Black and white photograph of 2 children transporting apples and a pumpkin in a wagon. Veterans Day is annually observed in the United States on November 11. In this photograph taken in a U.S. Army hospital in France, Mr. Milton D. Cohn, National Commander of the Disabled Veterans Organization, pins the Purple Heart on Private Earl Webb of Hanover, Pennsylvania. Woodcut from Conrad Gessner’s, “Historiae Animalium, Vol. 1, ” illustrating a common scene in autumn- a squirrel gathering nuts for the winter. “Fruits and Veggies More Matters” is a healthy-eating campaign observed in the United States each month in September. The poster features a variety of fruit including apples, which are synonymous with autumn – prime apple-picking season as many varieties ripen during the cooler months. More images can be viewed in Images from the History of Medicine (IHM) in NLM’s Digital Collections. Beautiful prints you bring us here! ‘La Cosmopolite’s one draw my attention specially. I like how they play with the colors and shapes to capture the attention, provoking without showing, and then you go something like ‘Hey!, wait a minute! What’s this add about? Oh! toothbrushes!’ and can’t help smiling to myself when rechecking it 😉 Thanks a lot for sharing!